The general meaning of the term ‘autism’ stems from the root words: aut meaning ‘self’ and ism meaning ‘orientation or state’. The overriding tendency is to be absorbed with oneself. The child’s thoughts, feelings and desires are governed by his internal apprehensions of the world. The internal is not consonant with the world of reality, giving the notion of pathology, wherein the individual sees things in the form of fantasy or dreams, wishes or hopes, instead of in terms of the reality that is common to others around him (Reber & Reber, 2001). In Berk (2000), autism is explained as impairment in emotional and gestural (nonverbal) behaviours that are required for successful social interactions. The language is delayed and stereotyped, with some autistic children not speaking at all. Autism is believed to be highly heritable; in the world of the autistic, words such as ‘believe’, ‘think’, ‘know’ and ‘pretend’ are seldom part of their vocabulary (Happe, 1995). 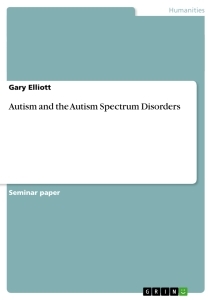 While autistic disorders probably do not have a single cause (Rutter, 1978; Sue, Sue & Sue, 1997), variations of autism (autism spectrum disorders) has been suggested to be the result of neurodevelopmental anomalies in white-matter development (Ellis & Gunter, 1999). Autism Spectrum Disorder (ASD) is a broad category of conditions that share similar symptoms; it is often referred to as pervasive developmental disorder (PDD) (Tilton, 2004). The most well known of the pervasive developmental disorders is probably autism (Banich, 2004). Dr. Leo Kanner coined the term in the 1940s while working as a psychiatrist at the John Hopkins University. At this stage, autism was seldom seen by physicians, but Kanner noted symptoms of communicative and socialization difficulties in patients, resulting in severe isolation and frustration for the sufferer. The child with autism seems to be isolated in his own little world, he makes no attempt at eye contact and is usually mute; he will resist change or interest in other people around him, while often seeming to be ‘stuck’ in inappropriate, repetitive routines (Stoppard, 2006). Tanguay (2000) identifies four basic characteristics of autism: qualitative impairment in social interaction; delays and abnormalities in language as well as other aspects of communication; restricted repetitive and stereotyped patterns of behaviours, interests, or activities, and an onset of the problems in at least one of these areas before the age of three years old. People with autism nearly always have severe problems with communicating (Mundy, Sigman & Kasari, 1990) and around 50% of autistic children never actually acquire ‘useful’ speech at all (Rutter, 1978). Common in autism is a disorder called echolalia, when a child will echo the words or sections of phrases spoken by others (Barlow & Durand, 2005). An unusual symptom of autism is a lack of responsiveness to adults (Kanner & Lesser, 1958). This may be partly due to their inability to effectively interpret emotional stimuli such as facial expressions or tone of voice (Hobson, 1993) and may be the cause for the lack of joint attention development. Joint attention development is the ability to coordinate his attention between himself, another person and the object or event of his attention (McArthur & Adamson, 1996). This deficit in communication can lead to frustration and anger in the autistic child that is attempting to make contact or communicate with another, without the ‘words’ or appropriate skills to effectively communicate he may withdraw further or lash-out in his attempt to be understood. Difficulties with communication are compounded by the child’s inability to acknowledge or even recognize the fact that other people may view things differently to them. It is inconceivable for the child, that people can have their own thoughts, feelings or beliefs different from his own. Conceptual thinking is an integral part of the maturation process in children and the inability to think conceptually will hinder progression and communication. This diagnosis falls within the spectrum of pervasive development disorders but the symptoms don’t place the child ‘neatly’ into one of the other particular categories (Tilton, 2004). This implies that the symptoms, though similar to those for autism, are not as severe. The child may make use of language in social contexts but the normal language milestones for a child may be delayed in their acquisition. Echolalia, common to autism may be less severe or completely absent and the child will usually have better auditory processing skills than would be expected in a child with autism. These children seem to have better social skills and will interact with other children and their parents to some degree. Their imaginative play may still be limited but there is definitely more interactive play than displayed by a child with autism. Most children with pervasive developmental disorders (approximately 75%) are also mentally retarded, suggesting that their IQ scores fall well below average, having been placed below seventy (Banich, 2004; Freeman, 1993). Asperger’s Syndrome was first documented by Dr Hans Asperger in the 1940s but was only recognized as an independent disorder and placed on the autism spectrum in the 1990s. The distinguishing factor in Asperger’s syndrome is the lack of delay in speech and motor skills found with autism. These children have been viewed as odd or eccentric for years, and as such diagnosis of Asperger’s syndrome is often delayed for many years. High-functioning autism (HFA) is often confused with Asperger’s disorder. HFA is less debilitating that autism; on a spectrum with classical autism at one extreme and PDD (NOS) at the other, HFA would fall somewhere in between the two. The distinguishing factor in high-functioning autism that separates it from Asperger’s syndrome is the level of motor skills functioning. A child with high-functioning autism does not have the motor skills deficits that a child with Asperger’s syndrome displays. Autism is perceived to be as common as 1 in 500 children but inclusion of all disorders on the autism spectrum places the prevalence as high as 1 in 9 (Stoppard, 2006). According to Volkmar, Szatmari & Sparrow (1993), autism is more prevalent among girls when the IQ score is below 35 and more prevalent among boys when the IQ falls in the higher ranges. This having been said, Rett Syndrome almost exclusively affects girls. The disorder has a genetic basis, with the severity of the gene mutation determining the severity of the condition. Rett syndrome is a very rare condition that affects 1 in 100, 000 children (Tilton, 2009). As the regression of motor functioning continues, the child will have difficulties feeding, dressing or engaging in daily activities. Mental and physical limitations will become increasingly evident as the child matures. The whole spectrum of autistic disorders affects the lives of more than 500, 000 families throughout the United Kingdom (Stoppard 2006). In addition to the categories mentioned above, there are less-known disorders that fall into the autism spectrum, such as: childhood disintegrative disorder, fragile X syndrome, auditory processing disorder, hyperlexia, Williams syndrome, Prader-Willi syndrome and Landau-Kleffner syndrome. Fragile X syndrome is the most commonly inherited cause of mild to moderate mental retardation. This disorder has been linked to between 2 and 3 percent of cases of infantile autism, a serious emotional disorder of early childhood involving bizarre, self-stimulating behaviour and delayed or absent language and communication (Bailey, Pillard, Neale, & Agyei, 1993). Research into fragile X syndrome, suggests that the defective gene at the fragile site is expressed only when passed from mother to child (Rose, 1995). In rare cases, a child may score in the mentally retarded range on IQ tests but they display specific and unusual abilities; these children are categorized as ‘autistic savants’ (Sue, Sue & Sue, 1997). These ‘splinter skills’ are much more common in children with an autistic disorder than children with generalized mental retardation. Acquisition of a diagnosis can be difficult to gain and difficult to accept. In the course of this section, we focus on the prevalence rates and how they seem to have increased; the possible causes of an autism spectrum disorder and signs and symptoms that may indicate to a parent that an autism-like disorder is present in the child.